Blackjack is an interesting casino game that can be played nowadays in almost every casino all over the world. The reason why, the game gained in popularity so much is that, it is not only very exciting but also challenging. It has a number of enthralling variations thanks to which it is possible to diversify your gaming experience greatly. 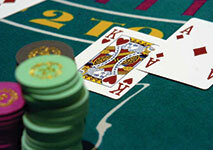 It has never been so easy to enjoy this game whenever and whenever you wish as a number of online casinos offer it. Many proficient players will tell you that when playing blackjack, you should have a solid strategy in order to stand a decent chance of winning against the casino and they are right. Indeed, this is the only way to improve your game and become a consistent winner in the long term. However, before you start learning a strategy, it is essential to get familiar with all of the terms in order to have the needed solid foundation and thorough understanding of the game. One of the basic terms that you should undoubtedly get acquainted with is the so-called hard hands as it is extremely important to know how to cope with such difficult situations. All of the hands that you get during the game are either soft or hard ones and it is really essential to be able to tell them apart and know the opportunities each one of them offers you. In brief, a hard hand is any hand that does not contain an Ace and usually in such cases, you can easily go bust with just one hit. These hands are rather risky and more often than not, they are stiff hands, meaning that their total is between twelve and sixteen. Therefore, it is essential to follow a reliable strategy whenever you get them in order to manage to make the best possible move in such tricky situations. In order to make this term as clear as possible, let’s have a look at some of the most common combinations which you will inevitably get at some point during the game. For instance, if your first two cards are a nine and a three, then you have a hard twelve. If you happen to get a nine and a four, then this combination is often referred to as hard thirteen. If the case is that you are dealt a ten and a six, then you have a hard sixteen. In this sense, if you have a pair of 7’s, then this is a hard fourteen and so on and so forth. Even though when you have a low value hand such as a three and a two, technically it is a hard hand, not many players consider it as such due to the fact that it can be easily improved and your chances of busting are not high. The most widespread strategy for hard hands doesn’t differ much from the well-known basic strategy which makes it easier to be perceived and learned. In general, in order to manage to make the best decision for your hand, you should take into account not only the total of your cards but also the up card of the dealer. The reason why is that you compete against the dealer and thus, you need to determine his position in order to be able to act accordingly. The only time when you don’t have to focus that much on the up card of the dealer, is when you are dealt a hard hand whose total value is five, six, seven or eight as in such situations it is best to always hit. It is recommended whenever you have such hard hands to continue drawing cards until you reach seventeen or you beat the total of the dealer. In case that you have a hard hand whose total is seventeen, eighteen, nineteen or twenty, it is best to stand. The reason why is that, these hands offer you decent chances of winning as they are already almost impossible to be improved. Most hard hands strategies use the same well-established principle – they suggest a particular move, based on the assumption that the face down card of the dealer is a ten. In order to figure out the best move in a certain situation, it is recommended to roughly estimate the total of the dealer. For instance, if the up card of the dealer is an eight, you should assume that his total is eighteen. The reason why is that, in a standard deck that consists of 52 cards, the cards that are worth ten points outnumber the cards that are valued as their face value. In a single pack, you can find sixteen 10-valued cards – four Queens, Jacks, Kings and Tens. Since your chances of getting such a card are higher than getting any other card, it is best to assume that you will be dealt one. All of the 10-valued cars are a real double-edged sword as they can help you form blackjack but they can also easily make you go over 21. 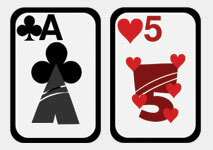 Hard 16 and Hard 15 hands are some of the most feared card combinations among blackjack players. In most cases, the total value of these two hands is not enough to beat the dealer and also it is very risky to try to improve them due to the fact that you have high chances of busting. If you have a hard sixteen hand and the up card of the dealer is nine, ten or an ace, then it is recommended to simply surrender if this move is available. Unfortunately, many casinos offer a number of variations which don’t feature this move as they are aware of the fact that it can be a really beneficial tool in certain situations. If you choose to surrender, you will be able to get back half of your bet and give the other half to the casino which is a good outcome of the hand since you were bound to lose the full amount of your initial bet. However, it is worth mentioning that if you have hard sixteen which consists of a pair of 8’s, then you should proceed differently. In such cases, you should split the hand, regardless of the up card of the dealer. The reason why is that if this pair is split, it will form a fairly decent new hands which have good chances of beating the dealer’s total. The same goes for the times when you have a hard fifteen hand and the up card of the dealer is a nine, a ten or an ace. In such cases, it is advisable to surrender as your chances of winning the hand are very low. If you happen to play a game in which this beneficial move is not allowed, you should stand when the up card of the dealer is from two through six and hit for the rest of the time. It should be noted that Surrender is highly advisable if the game is played with six or eight decks of cards. Learning how to handle hard hands in blackjack is crucial as such combinations will inevitably occur at some point during the game. If you want to manage to deal with them successfully, you need to know the best moves you can make in such situations. Moreover, if you are able to use the term for hard hands correctly, you will undoubtedly impress all of the participants on the table and show that you are a skilled blackjack player. In order to manage to educate yourself and understand blackjack books, you should be familiar with the basic terms, among which are hard hands.